In 1853, when poverty was widespread after the famine, the Presentation Convent and its primary school was established in Mitchelstown. Prior to that, hedge schools had provided education since there were few Catholic schools in Ireland as a result of the Penal Laws. 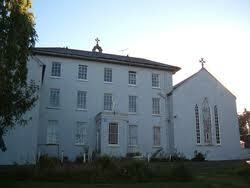 On 4th July 1853, the school attached to the Mitchelstown convent opened. Within one month of opening 637 girls were admitted to the school. Women from the town helped to run the classes for a short time until more nuns joined the Presentation order. In March 1887, a southern wing was added to the convent to extend the school accommodation. This extension was used as a school until 1911. The building of a completely separate Presentation primary school began on 9th September 1909. The cost of the new promary school anpounted to £3026 13s 07d (less than €4,000). The British Department of Education gave a grant towards the school The building was completed in 1910. Rev. Michael Ellard C.C., blessed the new grounds on 13th June 1911 and the new school was opened on the feast of the Sacred Heart 23rd June 1911. The children were very enthusiastic as they were led in procession from their old school to their new school. Three hundred and forty-six pupils were enrolled at the time. In 1976 the girls' school of 1910 was renovated. An extension was added to the school, which became a separate Junior school.. It also included a staff room and principal's ffice. Classrooms were mosernised in the last 1970s. The old rigid school desks were replaced with flexible seating arrangements. Each classroom was fitted with its own sink, and most floors were carpet-tiled. During the 1980s an oil-fired central heading system was installed.